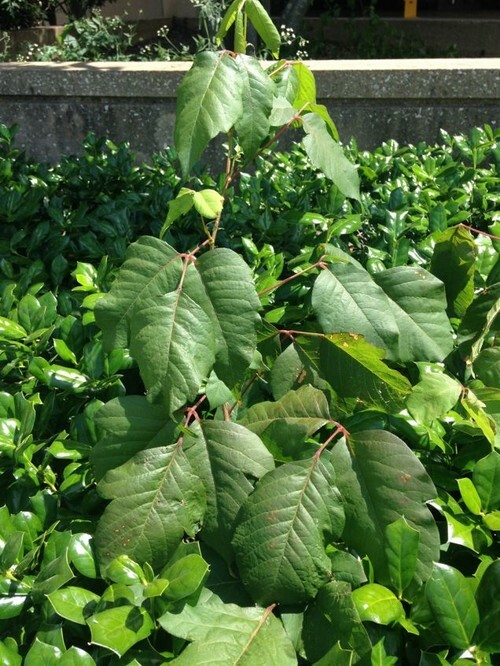 Poison ivy, oak and sumac are some of the worst landscaping problems that you may have to deal with. According to specialist, more than 85% of people are allergic to these obnoxious weeds. That means that getting rid of them in our landscape and/or gardens is a must. But it also means that doing so can be risky. So, these are the important things that you need to know when getting rid of poison ivy, oak or sumac. The first thing that you need to know, when dealing with poison ivy, is what it looks like. After all, if you can’t identify the vine, then you can’t avoid it or get rid of it. If you have heard the saying, “if leaves of three, leave them be,” this is probably the best advise. Poison ivy has three leaves at the end of each stem. It grows pretty much everywhere in the US and Canada, except Alaska, Hawaii, and just a few other states. The leaves start out as tiny, purplish or reddish colored leaves that look very shiny. Then they grow into a larger, duller and greener leaf. So, watch out. They come in all sizes. It grows as a vine, but can appear as a clump or spiral up a tree. So, that is probably why some people are confused into thinking that it is either a shrub or an actual tree. In the image above, the poison ivy has grown up all three of the foreground trees. It also is covering the ground on both sides of the pathway. This is not a place that I would want to take a nature hike. Here, the poison ivy has sprouted up right in the middle of some holly shrubs. This would be a delicate place for removal. Care would need to be taken to not damage the shrub. Yet, if any roots are left behind, the problem will reoccur. The image above is poison oak. It is similar to poison ivy in that it has three leaves at the end of each stem. To the less discerning eye, that may be the only distinguishing feature that it has from an actual oak leaf. It also grows as a vine that can look like a shrub, ground cover, or can climb up a tree. Like poison ivy, the young leaves have a purplish to reddish tint which will turn to a brighter and deeper green as the leaves mature. It grows mostly along the Pacific coast line. And finally, we have poison sumac. Unfortunately, it is also wide spread across the US and Canada. But, luckily this plant only grows in boggy or swampy areas. So, for the most part, we don’t have to deal with it invading our lawns or gardens. It looks quite different than poison ivy and oak. It grows as a shrub and can have between 7-13 leaves attached to each stem. One main identifier is that the stems will always be red. So, if you see a shrub that has red stems and offshoots of berries, just avoid touching it. For poison ivy, I prefer to pull out the big guns. I know that a lot of people hate to use chemicals in their lawns, and I am one of those. But, poison ivy is quite hard to get rid of and I don’t play around with it. For areas that are small, I prefer to spray it with the spray gun provided. But, on large areas or vines that have gotten out of control, I prefer the dunk and soak method. I pour the ivy killer in a five gallon bucket. Then, push a long section of the vine down into the bucket and leave it overnight. This allows the vine to really soak up the killer and carry it all the way down to its entire root system. I found that this works extremely well, and much better than trying to spray each leaf. (Tip: Before doing a dunk and soak method, make sure that you are fully clothed – long sleeves, pants, gloves, etc. Then when finished, thoroughly clean your skin with a poison ivy wash, such as tecnu skin cleanser, to make sure that none of the urushiol oil was able to get on the skin). If you have a very large area of poison ivy or oak to get rid of, and you don’t want to use any chemicals, consider using goats. They can eat an entire patch of poison ivy down in no time. Plus, it doesn’t bother them. There are a few things that should never be done with these plants. Keep in mind that these apply during every season, because although poison ivy may die off during the Fall and Winter, the oil that causes the rash is still present. Yes, that’s right. You can get the rash even from a dead plant. Never, ever burn these plants or any part of these plants. The oil that causes the problems can become air born. Inhaled smoke can cause potentially fatal results. Another big no, no. Do not run a mower over these plants, even if they are dead. Again, doing so will cause the oil to disperse into the air. As a result, you could end up with a widespread rash. When getting rid of poison ivy, you can bag it and toss it in with the rest of the leaves and brush to be taken away. Or, you can bury them and let nature takes its course. Eventually, the oils will break down and decompose. However, it takes quite a while for this to occur. So, if you are burying plants, do so in a location that you will not need to access. Some images courtesy of Creative Commons by: Rusty Clark, Bill Smith, Beatrice Murch, Robert Donovan, Regexman, Gord Webster and AgriLife Today.